The journey from my boyhood in Senegal to the neurosurgical operating rooms of New York has been nothing short of magical. As I moved through my medical training, I always dreamed of bringing my expertise back to my native country, but I knew the realization of that dream would likely be many years in the future. 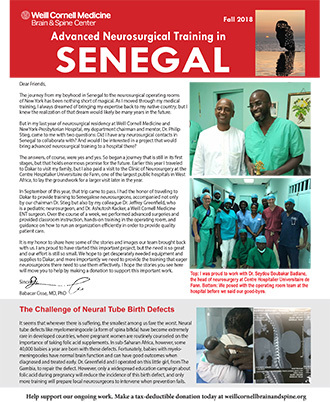 But in my last year of neurosurgical residency at Weill Cornell Medicine and NewYork-Presbyterian Hospital, my department chairman and mentor, Dr. Philip Stieg, came to me with two questions: Did I have any neurosurgical contacts in Senegal to collaborate with? And would I be interested in a project that would bring advanced neurosurgical training to a hospital there? The answers, of course, were yes and yes. So began a journey that is still in its first stages, but that holds enormous promise for the future. Earlier this year I traveled to Dakar to visit my family, but I also paid a visit to the Clinic of Neurosurgery at the Centre Hospitalier Universitaire de Fann, one of the largest public hospitals in West Africa, to lay the groundwork for a larger visit later in the year. In September of 2018, that trip came to pass. I had the honor of traveling to Dakar to provide training to Senegalese neurosurgeons, accompanied not only by our chairman Dr. Stieg but also by my colleague Dr. Jeffrey Greenfield, who is a pediatric neurosurgeon, and Dr. Ashutosh Kacker, a Weill Cornell Medicine ENT surgeon. Over the course of a week, we performed advanced surgeries and provided classroom instruction, hands-on training in the operating room, and guidance on how to run an organization efficiently in order to provide quality patient care. It is my honor to share here some of the stories and images our team brought back with us (see newsletter at right). I am proud to have started this important project, but the need is so great and our effort is still so small. We hope to get desperately needed equipment and supplies to Dakar, and more importantly we need to provide the training that eager neurosurgeons there need to use them effectively. I hope the stories you see here will move you to help by making a donation to support this important work. continue his work in Senegal.